Newt Gingrich: It Is His Time? Newt Gingrich’s campaign was left for dead a few months ago, as campaign debt expanded and his campaign staff deserted him for Rick Perry and other campaigns. He is still in debt, but his performance in the debates have allowed him to stay in the race as he now is behind Herman Cain and Mitt Romney but ahead of others including Perry. The question remains, can Newt actually win? Let’s be blunt, he will be the first thrice divorced American to be elected President, and that is hardly something one campaigns on. Alos, his present wife is the woman he had an affair with when married to wife number two. So the questions remains, can a man whose past life has been hardly a model of tranquility win? 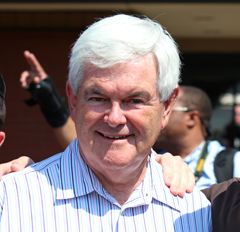 Going into the race, Gingrich had three things against him. The first was his personal life; the second was his thirst for playing with ideas. There was no idea too small to investigate or consider and there were times that Gingrich would stick his neck out for some ideas not worth considering, and when he appeared with Nancy Pelosi for some green initiative on a TV ad, it was Gingrich being Gingrich. The third was, and still is, his campaign has no money and no organization to speak of. All he had is his voice and ideas, though most of them good. In the debates, Gingrich has been the most consistent and least combative among his fellow Republicans. He has defended conservatisms better than anyone and has actually built new respect from the grassroots, even though they have doubts about him or his chances. Gingrich had one thing going for him in the early stages of the campaign; no one bothered to attack him since he was so far behind. He was free to expound upon his ideas and simply attack Obama and Democrats. This has allowed him a clear shot to explain his ideas and this has given him a bump in the polls. While Gingrich has yet to have a big bump in the polls, he is no longer at the bottom, and now he is in position to take advantage of any fall in the polls from Cain or any more failures from the Perry camp. Perry has his own tax plans out and he now has a plan to talk about plus a vision of how he would govern, but the biggest question with Perry is can he even sell his own plan? His performance in the debate has seen a candidate incapable of defending himself or his ideas. While there is still plenty of time left for Perry to get back in the race with his tax plans and maybe improve his performance, there is no doubt that no one has shown the same ability to sell conservative ideas than Gingrich and maybe Republicans voters might want to ask themselves, who do you want to debate Obama next fall? As for Gingrich's personal life, Americans can be forgiving if a person seeks redemption and Gingrich's personal life has appeared to change. He has converted to Catholicism, seemed more comfortable in his own skin and his present wife seems to be the one he has searched for. It should be noted that his two daughters from his first marriage work for him in the campaign and been willing to defend him against what they consider misinformation like the story that Gingrich served divorce papers to his first wife while she was recovering from cancer surgery, something his daughters denied ever happened. Let's face it, Americans have been forgiving of Bill Clinton even with all of his philandering in the White House and before. Many Democrats dream of the days when Clinton was President; often forgetting that Newt Gingrich played a significant role in the success of the Clinton Presidency. It was Gingrich who led the charge against Hillary Clinton health care reform, and it was Gingrich who managed to get the biggest capital gain tax cuts, helped Clinton pass various free trade agreements, worked with Clinton to balance the budget and passed the most significant entitlement reforms. Without Gingrich's cooperation, the Clinton Administration would have ended in failure. Gingrich proved to be an effective Speaker of the House and despite his leaving the Speakership after a disappointing mid congressional election in 1998; one can argue that he was the most effective Republican congressional leader. He got significant conservative ideas passed despite being the leader of the Party in opposition. Nor can anyone deny that Gingrich managed to get Republicans the House of Representatives for the first time in 48 years due to his political strategy. His own personal failings helped in his downfall, but he showed that he could advance conservative ideas. While many would consider Gingrich a Washington insider, the reality is that he was always the outsider, a back bencher in the Reagan years who often fought the leadership of his own Party. Even when he held command, there was always that feeling that he was not the establishment. Gingrich now has a serious shot and often money flows to successful candidates. Who knows, maybe some money will flow Gingrich's way. Gingrich is now running an insurgent campaign similar to Cain, only without the glitter or charisma of Herman Cain. But then Gingrich has run insurgent campaigns before and won.